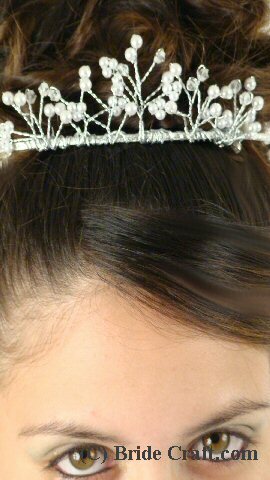 Wire Tiara Do you want to achieve the princess look for your special day? 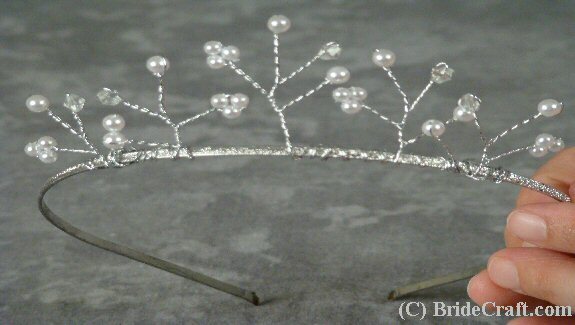 Then don’t forget the tiara! 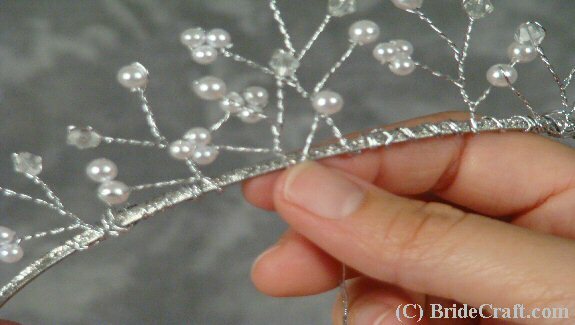 Want to know how to make a one-of-a-kind tiara? Then you're in the right place! Below you will find a step by step tutorial showing you how to do just that. Pros: Very simple to make, and absolutely customizable. Extremely inexpensive, also. Done with a bit of care and a careful eye, it can make a stunning addition to your wedding look. Cons: The wires can be squished out of position and need readjusting if not packed right. And as costume jewelry becomes cheaper, it quickly catches up with this item price wise. 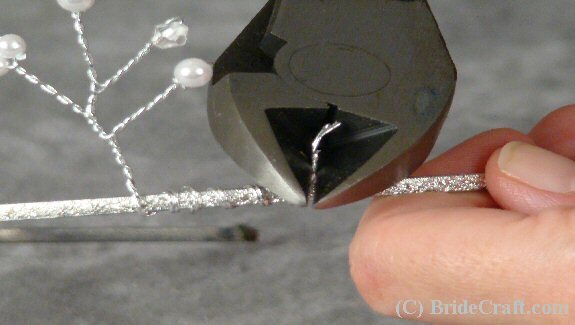 Step 1: You will need 7 to 13 wired jewelry pieces, a silver metal head band, wire cutters and super glue. Tip: When choosing the head band, find one that is thin and possibly with a mottled texture. This will help disguise the wires a bit. 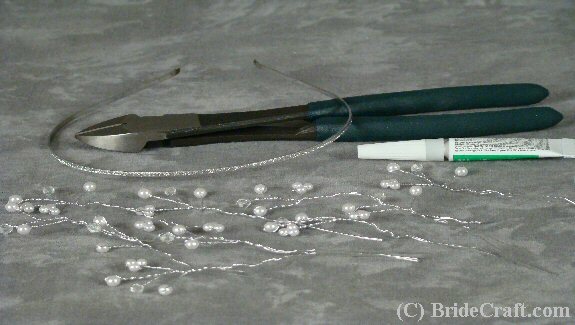 Step 2: Center your first piece of jewelry wire on the head band and wrap it so that it is secure. Keep it as flush with the metal band as possible. Step 3: Trim any excess wire when you feel the piece is secure enough. Extra wire will make the band look thick and might make other wires that will be added lumpy looking. Step 4: Repeat step 3 on either side of the first piece of wired jewelry. Each additional piece should be a little bit lower than the one it’s next to. This will help create a triangular effect. Step 5: Add another two pieces on either side of the last pieces added. Again, these should be positioned lower. Adjust the wires as you go. 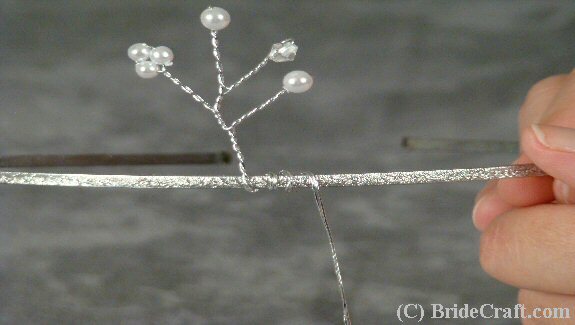 Step 6: Position more wired pieces against any obvious “holes” on the tiara. Add several pieces until you are satisfied. 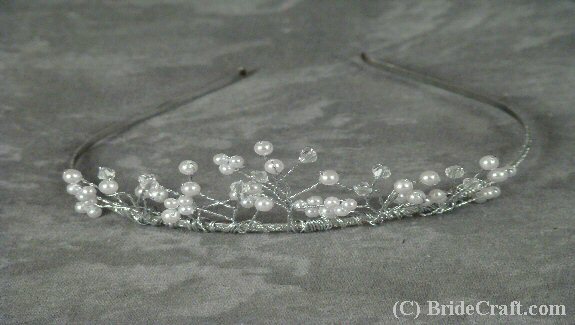 You are basically creating a second, lower layer to thicken the tiara up. 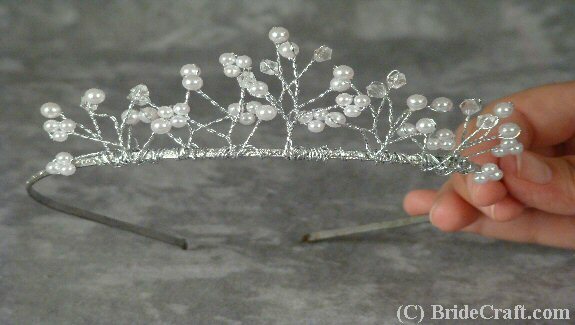 Tip: I’ve chosen to keep my tiara light and airy….you don’t have to! 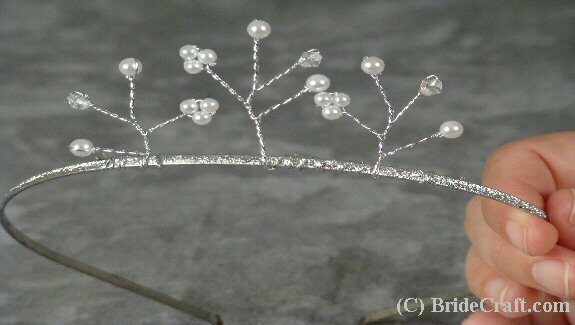 You can keep adding layers of wired jewels until you are satisfied with how the tiara looks. Step 7: You should have something like this. Adjust the wires until you feel they are in the most attractive position. Step 8: Take your super glue and lightly adhere the wires to the metal band so they do not slide or change positions from the base. Use an extremely light hand with this, and work from the “back”, so the glue isn’t seen. 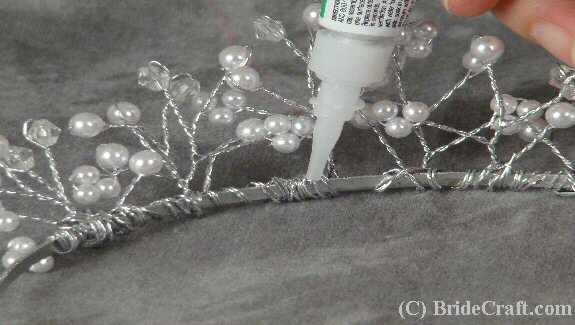 Step 9: Once the glue dries, feel free to sit around the house with your tiara on and fantasize about being a wedding day princess.